« Booking for the 2009 Transition Conference is now open! 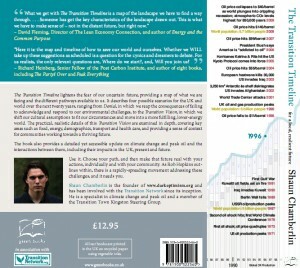 Shaun Chamberlin’s masterwork, ‘The Transition Timeline’, is now complete and available for order. As someone who has been intimately involved in its conception and its production, I don’t think that a review from me would be of much use. It is of course brilliant, I love it. It is a powerful and vital addition to the Transition literature, and it deserves to be a best-seller. You can pre-order your copy here, and be the first person on your street to own one (we get the actual copies in a few days). The book will have two launches, one at the Kingston screening of the Age of Stupid on Sunday March 15th, and one at the Totnes Bookshop at 7pm on Wednesday 1st April. In the meantime, here is the foreword I wrote for the book. Western economies. We may well be on the edge of the first recession underpinned by a geologically imposed oil peak. unfamiliar world, one where businesses around us are closing, the world is nudging its climate tipping points, and the economic situation is profoundly altered. the nuts and bolts of what a more localised, low energy world might look like, we lack the understanding of how to get there, how we bring it into existence. The idea for this book came out of one of those days at work when the mind starts to wander, around 3.30pm on a Friday afternoon, when I was looking vacantly at the now famous ‘Oil Age’ poster produced by the Post Carbon Institute. It offers a wonderful overview of the Oil Age, identifying the crucial points in history as humanity made the dizzying ascent to its current consumption of around 87 million barrels of oil a day. dates that might define our collective, careful and considered way down the mountain. In Transition Town Totnes, as part of an event we ran on Transition Tales a short while later, we spent a couple of hours coming up with the first attempt at such a thing. We put peak oil in 2010, the introduction of carbon rationing in 2011, ‘peak cars’, the point beyond which the amount of cars on the UK’s roads begins its inexorable decline, in 2012. By 2015, Totnes had created its first urban market garden on the site of a former car park, 2016 saw the town introduce a free bicycle scheme and by 2017, schools had to give days off during the nut season in order to help with the harvest. By 2020, 50% of food consumed in the town was locally grown. Although our timeline was a mixture of the serious, the studied and the downright silly (e.g. 2021, first great white shark attack on the River Dart), it became an object of great fascination, people spending hours poring over it, alternately giggling and looking very serious. It struck us that there is something very powerful about such timelines, and as Transition Town Totnes entered its Energy Descent Pathways process, it rapidly became one of our key tools. 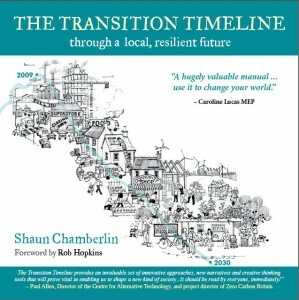 Later in this book we will share some of the tools and exercises we have developed, in the hope that, combined with the thinking around Timelines developed in this book, they will be a powerful resource in planning for the future of your community. One of the key themes of this book is stories, the ones we tell, and why we so urgently need new ones. We really only have a small handful of future stories in our culture. There is the default Business as Usual story, the one that assumes the future will be like the present, but with more of everything. Then there’s the one that assumes that everything will collapse around our ears overnight, leading to a Mad Max-style world of bandits and hairy men eking out a living from mouldy potatoes and roast squirrels. Finally there is what David Holmgren calls the ‘Techno-fantasy’ story, the one that has us living in space stations, nipping to the Moon on holiday, growing food in bubbling tanks of chemical gloop. appropriate for the first generation needing to design a successful path down from the pinnacle of the energy mountain, and to respond with sufficient purpose and depth so as to avoid runaway climate change. We need new stories, the ones about the generation who saw the problems, looked them square in the face, and responded with courage and adaptability, harnessed what excited them and acted both as midwives for the birth of a new way of living and as a hospice for the passing of the old, unsustainable way of doing things. Feels like one of those moments when there’s a significant shift. Congrats to Shaun for a really special contribution to an abundant and humane future. I concur that new stories are absolutely vital. As Ulrich Beck said, the age of the grand narrative is over, replaced by many new ones instead. While we followed the rather undistinguished story of one humanity, one progress, we have to concede that there are different ways and learn to live in the diversity this creates. I can’t wait to check out the Transition Timeline. I just wanted to pipe in and say that Post Carbon Institute was not the creator of the Peak Oil Poster. The Institute did provide support but the creators are SF Informatics, which I believe was founded by members of the group San Francisco Post Carbon.